A Tashkent survives after ramming an enemy Yūgumo. Ramming is the act of colliding with another ship. Typically, ramming an enemy ship is a last-ditch tactic, as it usually results in the destruction of the involved ships. A collision between allied ships causes team damage, but the amount of damage is drastically lower than those between allied and enemy ships. If a player rams an enemy ship during a battle and survives, that player will be awarded a Die Hard achievement. What would be the effects of a successful ram? For example, ramming a battleship with a destroyer is rarely worth it, since it will certainly sink the destroyer but might not sink the battleship. How likely are you to pull off the ram? If you cannot survive long enough to ram, it is not a good idea to try. How likely is the target to die without you ramming them? If the local situation already favors your side, it is probably not worth throwing your ship away. How much health do you have, and how much health does your target have? If you are at low health and your target is at high health, it is a more favorable trade than the reverse. Proximity. The closer you are, the less chance the enemy has to notice and sink you or get out of the way. Facing. Most successful rams are head-on, or at least start that way, since this provides the highest rate of closure and the fewest options for the target to avoid your attempt. Speed and maneuverability. An advantage here means you reach your target quicker and makes it harder for the target to dodge. However, note that destroyers and cruisers, while generally faster and more maneuverable, are less likely to trade advantageously even if they do pull off the ram. Health. High health makes it less likely to be sunk before ramming. However, high health also makes the ram a worse trade. Local tactical situation. If there are many enemy ships with good shots on you, it is less likely you will be able to survive to ram successfully, especially given that the approach often will put you in an increasingly vulnerable position. Unfortunately, as with health, a good local tactical situation generally makes the ram a worse trade. Torpedoes. 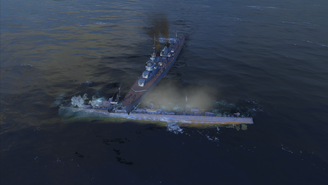 Attempting to ram a target that has torpedoes is very dangerous, since attempting a ram will put you in a perfect position for them to hit you with them. If you judge the ram is likely to succeed, you may want to shoot enemies other than your ram target, given that both of you will likely be destroyed in the ram. Make sure you don't get too distracted and miss your ram though! On the other hand, if the ram is unlikely to succeed, or the ram target is a ship you simply must eliminate, you can shoot them for a little extra insurance. If you are lucky you might sink them first and not have to give up your ship in the ram. If your ram target notices your attempt too late, they may attempt to turn around. This is a good opportunity to shoot them in the citadel. Sinking enemy ships or disabling their armament on the way in can help you survive to ram. Shoot at key enemy ships, turrets, and torpedo tubes. Unlike shells or torpedoes, your target is most likely around the same speed as your own ship. A successful ram against a moving target thus requires sailing to intercept where they will be, rather than where they are now. This is especially true if they have guessed your intention to ram and seek to avoid it. Use your consumables aggressively. One way or another, they will likely soon be of no further use to you. You are almost certainly not going to get another chance to ram: you are now traveling away from each other, and one or both of you is likely to be sunk in short order. If you pre-turn your guns, you can try for a point-blank citadel shot as you pass each other. If you have torpedoes, use them. In some cases this may call for turning away from the enemy to get your other side's launchers to bear. Consider whether there is another nearby target you would like to try to ram. Don't go around corners with an approaching enemy on the other side who might want to ram. If the enemy is at a clear disadvantage yet still has significant health left, don't charge him too aggressively. Decide whether you even want to avoid the ram. For example, your enemy may be making a mistake in ramming, or avoiding the ram may be too costly in other ways. The ram may even be mutually beneficial in ways other than winning. If you decide to try to avoid the ram, shoot the would-be rammer, and get your allies to shoot him as well. If in a appropriate ship, reverse bow-on. This will greatly delay the ram if done early enough, giving you and your allies more time to sink the rammer, or at least giving you more time to get some last damage in. If you have to, turn around. This may give the enemy a shot at your broadside, though. If you have better maneuverability, try to fake out the would-be rammer by turning to one side, then the other. This page was last modified on 23 January 2019, at 09:06.